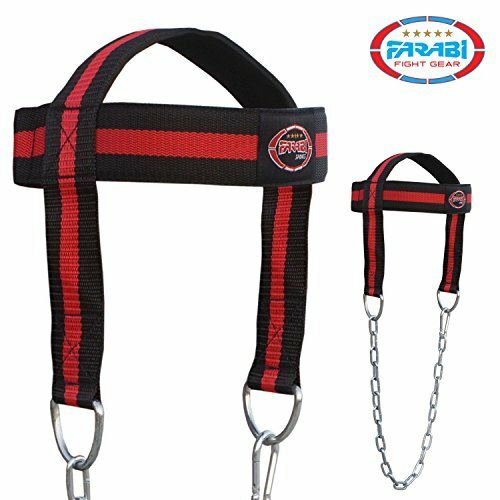 Farabi Pro head harness is a special gear for strong next and head exercise. Uniquely designed Farabi neck flex focus the stress on the less grown muscles of the neck. Made from prime quality G2-Nylon this head harness has the ability to carry maximum weight and focus the weight to the specific neck muscles that need growth. Equipped with the Neo-gel neoprene material for comfort and protection of the head. Stitched using a RAW Triple-needle fleece Pico-thread which strengthen the composition and make this gear extremely durable. The Neo-Gel Integrated composition provide added protection cushioning for heavy weights. It also ensures the stable lifting posture for the head and neck which reduces the chance of injury to the lowest possible. The G2-Nylo neck flex provides a stable and firm head and neck support to the entire spinal cord and permit easy transition from light to heavy weights. The D-hook powered with a Nylo strap has the ability to transform the weight equilibrium from the head to the neck muscles for gross easy lifting. The Neo-lone head strap is versatile adjustable and wickedly strong. The head harness by Farabi helps retain better neck and head posture lowers the risks of having aches and pain and provide better disposition. The HG-steel chain allows easy lifting progressions restrict the movement of head within the natural range of motion which augments the growth of the muscles. The G-strap allows easy adjustability according to the correct size. Farabi Pro head harness is a special gear for strong next and head exercise. Uniquely designed Farabi neck flex focus the stress on the less grown muscles of the neck. Made from prime quality G2-Nylon this head harness has the ability to carry maximum weight and focus the weight to the specific neck muscles that need growth. Equipped with the Neo-gel neoprene material for comfort and protection of the head. Stitched using a RAW Triple-needle fleece Pico-thread which strengthen the composition and make this gear extremely durable. The Neo-Gel Integrated composition provide added protection cushioning for heavy weights. It also ensures the stable lifting posture for the head and neck which reduces the chance of injury to the lowest possible. The G2-Nylo neck flex provides a stable and firm head and neck support to the entire spinal cord and permit easy transition from light to heavy weights. The D-hook powered with a Nylo strap has the ability to transform the weight equilibrium from the head to the neck muscles for gross easy lifting. The Neo-lone head strap is versatile adjustable and wickedly strong. The head harness by Farabi helps retain better neck and head posture lowers the risks of having aches and pain and provide better disposition. The HG-steel chain allows easy lifting progressions restrict the movement of head within the natural range of motion which augments the growth of the muscles. The G-strap allows easy adjustability according to the correct size. If you have any questions about this product by Farabi, contact us by completing and submitting the form below. If you are looking for a specif part number, please include it with your message.